I’m teaching a workshop called “Introduction to Blogging: Finding You Blogging Voice” as part of the San Miguel Writers Conference on February 21 and 22, 2011. Click here for details and here to register (scroll down to green button). Below is the general press release about the conference. 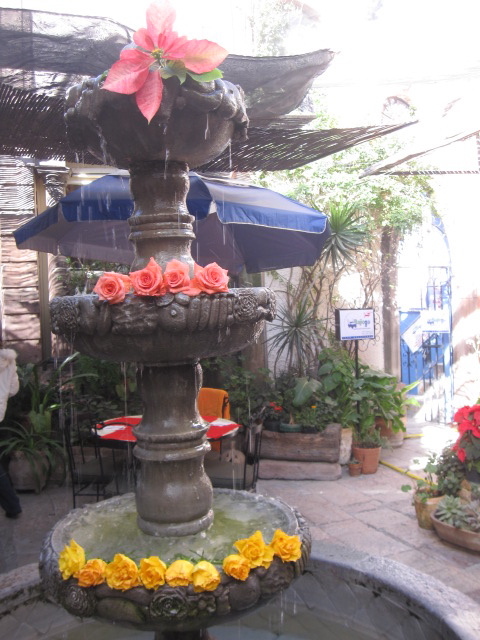 The fountain at Cafe de la Parroquia is one of my favorites in San Miguel. It's always decorated with flowers. San Miguel de Allende Mexico. Sandra Cisneros, author of the million-copy best seller, The House on Mango Street, and a widely acclaimed authority on Chicano/a and bicultural issues will keynote the Sixth Annual San Miguel International Bilingual Writers’ Conference, to be held February 18 to 20, 2011 in historic San Miguel de Allende, MX. Her keynote is entitled, ” Living in los Tiempos de Sustos.” Cisneros heads up a faculty of forty-two distinguished writers that includes Elinor Lipman, author of nine much-beloved novels, and Mexican author Mónica Lavín, who recently received the prestigious, $500,000 peso Elena Poniatowska Prize – awarded by the Mexico City government – for her novel, Yo la peor (I, the Worst) about Sor Juana de la Cruz. Topics geared to writers at this year’s conference will include among the 36 sessions discussions on travel writing, crime fiction, feature articles, personal essays, screen writing, and poetry. Writers may also enter the manuscript contest. The winning ten writers receive a free individual consultation with top literary agent, Kristin Nelson. Readers also will find much to savor with sessions on everything from Francine Prose’s book, Reading Like a Writer, to an Introduction to Chicano literature, to appreciating modern poetry, to a whole workshop on the important African American book, Their Eyes Were Watching God. ” For the annual San Miguel Big Read, during December and January, everyone in San Miguel will be encouraged to read the featured novel for the conference, Caramelo by Sandra Cisneros, and to join one of many book discussion groups around town. The need for literary events in Spanish was dramatically presented in a 2005 UNESCO report outlining the low numbers of readers in Mexico. According to the report, Mexicans read on average just over two books per year, while Swedes, for example, finish that many every month. Since its inception, the San Miguel Literary Sala, which produces the Conference, has been committed to including Mexicans in its literary offerings, and encouraging them to discover the pleasures of reading. All conference general sessions are simultaneously translated with earphones, and many of the workshops are offered in Spanish. Additionally, the conference will include an intensive workshop in creative writing for thirty San Miguel high school students, who can also participate in the entire Conference for free. More information on the conference can be found at www.sanmiguelwritersconference.org. Hello! 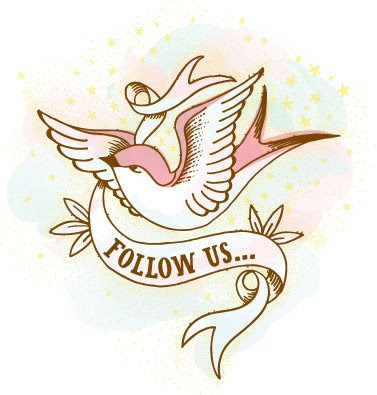 Lucky’s custom letterpress Twitter icon. I’m heading down to San Miguel de Allende to visit my mom and will offer a “Twitter 101: They Don’t Call It Social Media for Nothing” how-to/why-to/what-to workshop on Thursday, August 20, 10am to noon, at our house in Colonia Guadalupe. I will cut through the Twitter hype with clarity, a rockin’ tutorial handout, and excellent snacks. US$25 or peso equivalent. To reserve a spot, please send me an email at ginahyams@gmail.com.